The first time I started up Hearthlands I was a little put off by the mobile-like graphics. 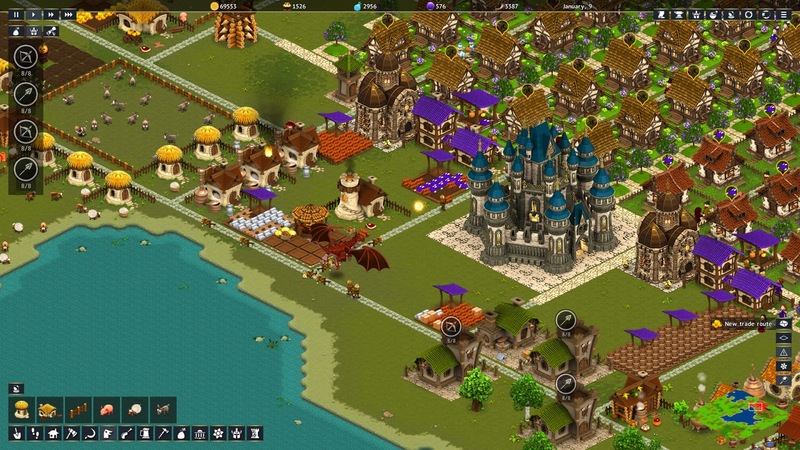 I honestly wasn’t expecting much more than a simplified city builder with a few Civilization like elements thrown in. My first game I was invaded by my temperamental neighbor because I kept saying no to his unreasonable demands and lost. My second game reached a crushing conclusion when a large giant thing decided to Hulk smash my little berg. Obviously I had underestimated this little creation and brought my “A” game for my third attempt. I managed to get a sizable army before being simultaneously invaded by a backstabbing neighbor and getting kicked in the face by a bunch of spirits I thought I was awesome enough to take. Hearthlands is deceptive with its cutesy graphics and placidly mindless people who are solidly in love with their material goods. However, behind all the cuddly pigs and similar looking buildings is a solid start to a very clean running early access game, even if it stays within the nation building mold. 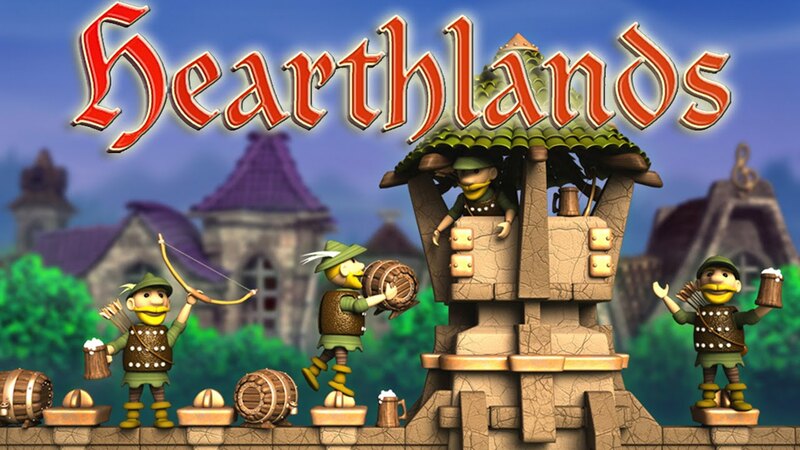 Hearthlands is like Civilization’s cunning six year old niece. You are the omnipotent creator of a (hopefully) soon to be great civilization who must eek out a living in a hostile environment while juggling the demands of your mewling masses and watchful neighbors. If you build the houses they will come (they being the poor plebeians...I mean faithful villagers) and you get to collect tax money to fund your city. In order to grow your city you must meet the demands of your citizens to make your little log cabins “level up” to nicer dwellings which hold more people and produce more taxes. Each successive level requires ever more complex items. All levels of items must be brought to the houses on a regular basis or the house down grades and you lose people and reputation. 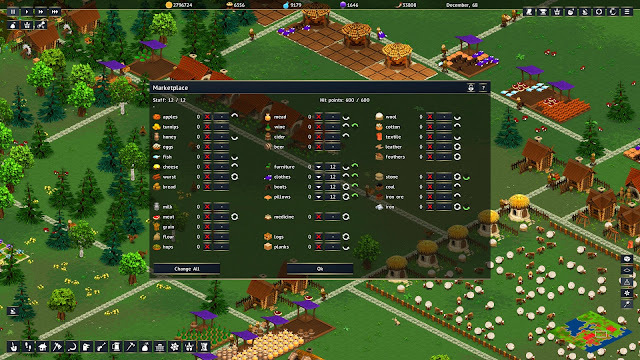 Higher level houses also create lore, fame and magic besides their increased taxes which can be used to buy permanent and useful upgrades, learn spells and make nice with the other nations. This system requires a well planned manufacturing sector and distribution network just like every other nation builder. I found balancing the creation and use of resources to be a bit of a challenge at times. Once I ended up with hundreds and hundreds of feathers clogging up every single storage area in my city before I managed to make enough pillow manufacturers and houses to use said pillows. With so many resources available to make any tweaks to the production line can set the whole thing out of whack. To me this is a plus. This sort of fine tuned management is what I like about nation builders, it’s a challenge and it satisfies my inner neurotic control freak. Some of those resources and tax funds will go towards creating your own standing army. This is something you should establish early one, a tip I learned the hard way. If you can’t defend yourself you will be at the whim of the other civilizations present who are extremely rude and will just demand that you give them things. That is not how we do things up here in the North! The combat system is a simple, point and click affair and your units aren't grossly overpowered making fighting an actual challenge. Mixed with the army aspect, relations with other nations becomes key to your continued existence. Most of the other nations will demand/ask that you give them things. If you can afford to donate items you can start to build a good relationship that helps you stay invasion free and occasionally gets you free stuff too. Through the world map you can spend fame to increase your relationships, ask for resources, send gifts, take out loans or use the stabby version of diplomacy and wipe them off the face of the map. Or at least try to. You can also try your hand at destroying the odd evil fortresses or dragon lairs. 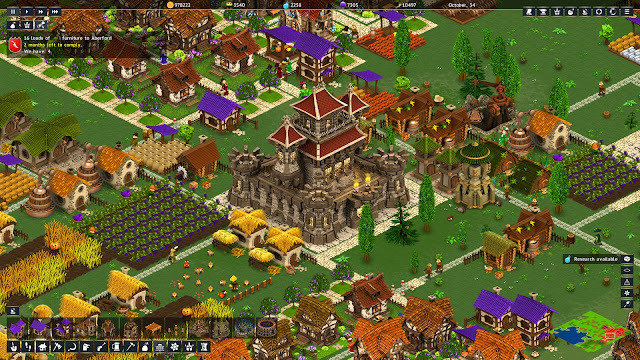 All these aspects are pretty routine to nation builders thought Hearthlands does slide itself comfortably into the fantasy genre with it’s wizard towers and ghosts. Even though there's nothing really new in this game it’s solidly made, running without a single glitch. All the mechanics are easy to understand and seem balanced. I did not finish the tutorial with might have lead to one or more of my failures but the interface was intuitive enough that I could pick things up on my own which I like. I also love the quirky achievements available such as “losing is fun” (watch your city burn) and “Over 9000” (have 10,000 population). I’d really love to see more of that humor bleed through into the rest of the game to try to help set it apart. If I have one major criticism it’s that this game desperately needs a new soundtrack. The same short song repeating over and over again quickly got annoying. I’d like to see something funky and upbeat to match the style of the game. Overall, I can see the amount of work that’s gone into Hearthlands and Sergio & Simon have a good start. However, there are many, many games out there like this one and there needs to be something that sets Hearthlands apart.